Early birds and night owls rarely agree on anything. However, they can both agree on this: SLO CAL mornings are something to behold. When that coastal fog burns off and that warm, sunny glow settles across the hills, the possibilities for the day feel endless (and, as you’ll read below, they pretty much are). From the beach to the mountains, SLO CAL offers oodles to rise early for. So, forget that snooze button and seize the day! The forecast says blue skies ahead. So, spring out of bed early to pack it all in! What&apos;s the old saying? The early bird gets the tasty tubes? There&apos;s no better time to paddle out into Central Coast waves than the a.m., when the wind is minimal and beaches feel calm and uncrowded. Claim your spot early and catch a gorgeous sunrise before your surf set. Prime surfing and boogie boarding is on tap at Pismo Beach, Shell Beach, Morro Bay, and Cayucos (plus there&apos;s plenty of rental shops where you can borrow a board or wetsuit). Love the water, but a little wobbly on the board? No worries. Early morning is the perfect time to traverse the placid waters of Avila Beach by stand-up paddleboard (your four-legged friend will also appreciate Avila’s dog-friendly sands, too). Find your beach adventure now! If you’d always “rather be fishing,” you’ll be right at home in SLO CAL. Fishing enthusiasts of all experience levels flock to our fantastic watering holes, and they do so early! Get while the getting’s good and enjoy freshwater fishing, as well as ocean and pier fishing, too. A few fave local spots? Santa Margarita Lake, where you can fish from shore or cast off from a boat or canoe. Lopez Lake, about 10 miles east of Arroyo Grande, offers up 1,000 acres of watery fun. In the warmer months, reel in crappie, redear sunfish, plus largemouth and smallmouth bass. The best-kept secret? At dawn throughout the year, anglers frequently reel in catfish that weigh more than 25 pounds. Talk about a SLO CAL souvenir to bring home! And don&apos;t forget about deep-sea fishing in Morro Bay or casting into the ocean in Pismo Beach, Avila Beach or Cayucos. 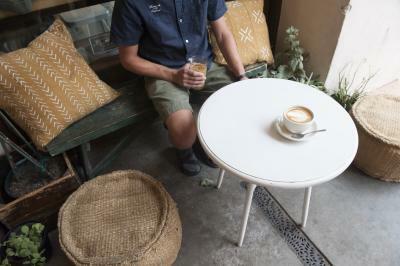 Third wave coffee isn&apos;t just for city folk. Chill SLO CAL is known for incredible roasts, fabulous foams and bountiful beans galore. Make a morning date and stop by Kreuzberg Coffee Co. in SLO or Paso Robles, where you can sip from a range of expertly roasted brews and start the day off with a hot breakfast (try the breakfast burrito or go for bacon and eggs served alongside crazy-good tater tots). At Spearhead in Paso Robles, ask one of their baristas for a recommendation and then order a pour over of epic proportions. Or, grab a cup of joe to-go at the Steaming Bean in Shell Beach and enjoy a nice morning sitting by the ocean. Got more time to hang? 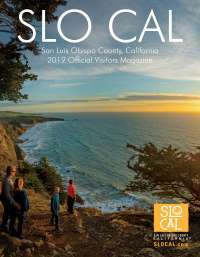 Go for Sally Loo&apos;s in the SLO Railroad District (home of farm fresh waffles and chilled açaí bowls) or Scout Coffee, where you can pick up bags of house roast while shopping a selection of stylish housewares at two gorgeous SLO locales. Downtown SLO&apos;s most rebellious sour beer brewery, Libertine Brewing Co, is home to a hip, adjoining coffee shop where you can find unique morning pick-me-ups, including barrel aged coffee and kombucha. Eye opening? Indeed. The SLO Swap Meet is almost as famous as the location where it’s religiously held: the Sunset Drive-In. One of the last working drive-ins in California, this unique venue is home to hundreds of enthusiastic vendors who bring new and vintage wares to market each Sunday morning. Experience the tradition and take part in the hunt! Not sure you&apos;ll be able to force yourself to get up at the crack of dawn, or at least around 6:00 a.m., then the swap starts stirring? Fortify yourself with a freshly made donut from SLODoCo. in San Luis Obispo or Surfside Donuts in Pismo Beach. When it doubt, donuts always win. Trekking through nature always feels good. But doesn&apos;t it feel doubly good to burn off your bagel and lox before most people have yet to sip their morning coffee? With more than a dozen beautiful open space trails, SLO CAL is the perfect place to lace up your hiking boots or jump on your mountain bike. Cerro San Luis is a popular trek for locals, and dawn is the best time to watch the world awaken below. Feeling ambitious? The 2,624-foot summit of Cerro Alto in Atascadero is one of the highest points in all of SLO CAL and delivers a panoramic view just waiting to be ’grammed. Thanks to the hazy morning sun, no filter required. Whether you’re new to the saddle or an authentic cowhand, there’s a horseback adventure waiting for you. Get a jump start on the day and book an early morning trail ride to remember. Watch the sun rise and admire all the native flora and fauna waking up below. Whether you choose to trot along green meadows at the world-famous Madonna Inn grounds, take a ride through vineyards in Paso Robles wine country, or prefer to romp across the beach at Montana de Oro, you’ll feel like a true Western hero.